As the third week of the 2017 Legislative Session kicks off, we are setting some unusual records. The number of visitors to the General Assembly Building has reached numbers not seen in 30 years. About 4,900 visitors are pouring into the Capitol each day and security lines reached far into the Capitol Square. My staff and I meet with nearly 150 people a day. We are also on course to break our record for the largest number of emails during a session at approximately 9,000 in 45 days. One of my most controversial bills is SB1060, which makes female genital mutilation a crime. Twenty-four states have passed laws to outlaw this brutal practice. Genital mutilation is the ritual removal of the female genitalia. This gruesome practice is typically performed in Africa, Asia and the Middle East, and this is now spilling over into America. Many families fly their daughters out of the country to skirt the law and perform this violent mutilation elsewhere. However, my legislation will not only make genital mutilation a crime, but it also gives a woman standing to sue her parents years later if they mutilated her as a little girl. My bill, SB1362, will allow active duty military personnel to carry concealed without a special permit. This bill was hotly debated but passed the Senate by a vote of 22 to 18. I have reintroduced SB1262, a bill to hold Sanctuary Cities accountable for any property damage or injuries committed by people in the country illegally. I expect it will be heard in committee soon. This year I have submitted SB1455, a bill to make it illegal to pay people to register to vote. This bill passed out of committee and is on its way to the full Senate for a vote. I am co-sponsoring Delegate LaRock's House Bill 1605, a School Choice bill. This bill establishes a Parental Choice Education Savings Account. With the first full week of session drawing to a close, legislators are wrapping up final committee meetings before heading home to their respective districts today. One of the most important aspects of serving as a "citizen legislator" is taking the time to listen to constituent feedback. In addition to receiving input via email and phonecalls while in Richmond, I enjoy talking with constituents at home in the district. Returning to Williamsburg each weekend allows me to hear in-person feedback so that I can best represent residents of the 96th House District. One sentiment I frequently hear is frustration with regulations and bureaucracy. While not all regulations are undesirable, they should be transparent, fair, and impose minimal financial burdens on businesses and families. Several House members have submitted bills to strengthen public input requirements on newly proposed regulations, create accountability for those agencies that think they should be exempt from public input, and generally scale back the tremendous amount of regulatory burden working professionals currently experience. I understand firsthand these challenges, and I look forward to working with my House colleagues to support this legislation. For information on the proposed Red Tape Reduction Commission, click HERE. Please also take a minute to read the recent Daily Press article outlining these initiatives. Thank you to all who have completed my 2017 survey, either online or via hard copy. If you have not yet done so, please take a minute to submit the survey online by clicking HERE. Results will be provided during the upcoming weeks. During this year's short session, legislators are focused on adjusting Virginia's biennial budget. Accordingly, the House Appropriations Committee is tasked with hearing budget amendments and making final recommendations. Although I am not an Appropriations Committee member, I am able to submit budget amendment requests. I introduced only three requests, one of which would provide funding for a mobile crisis team for a local agency, Colonial Behavioral Health. A mobile crisis team provides 24-7 on-scene evaluation, treatment, and interventions for individuals and families who are dealing with a mental health crisis. Click HERE to read the budget amendment. 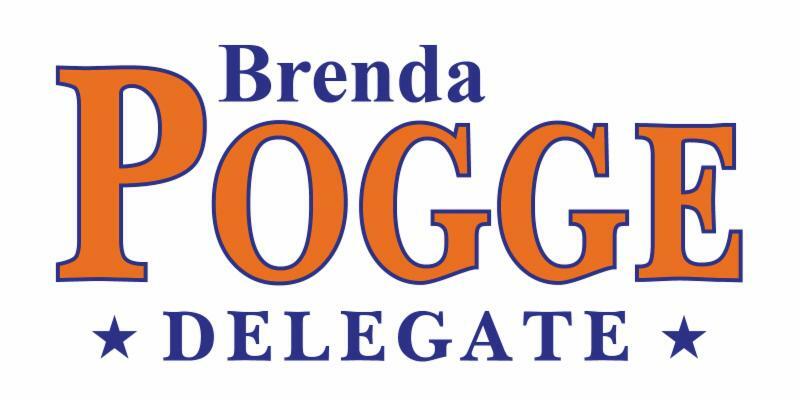 If you are unable to visit, you may reach me via email at DelBPogge@house.virginia.gov or by phone at 804-698-1096. If you find yourself in Richmond, my office is located in Room 403 of the General Assembly Building at the corner of 9th and Broad Streets. Take a moment and smile -- today is Obama's last day in office! Tomorrow at noon Donald Trump becomes the 45th President of the United States. I've never been more optimistic about the future then I am right now. But Mary, you and I must not rest on our laurels. Now is the time to push forward and finish the job Donald Trump started by taking Richmond back from the political elites this November. That's why I'm counting on you to let me know you're with me by chipping in a generous contribution of $25 so I can send you a campaign t-shirt in the mail. But before you order your shirt, Mary, please allow me to share some more big news with you. On Tuesday, I told you how numerous Ted Cruz Presidential campaign staff had joined our team to help take Richmond back. Today, on the eve of Donald Trump's inauguration, I'm excited to announce 12 more members of the Virginia Trump Team are publicly supporting my campaign. All in all, Mary, that's nearly 25 members of the Virginia Trump Team working together with you and me to take back Richmond! These men and women formed the backbone of Trump's Virginia campaign, helping him raise more than $1 million dollars in the Commonwealth. And they're now using that same passion, drive and determination to help us defeat Terry McAuliffe and his liberal elite allies. I've included a full press release down below with more details and information for you. Mary, this is our year. The wind is in our sails. Please join me in the fight to take back Richmond by chipping in $25 to get your Stewart for Governor shirt shipped directly to you. And remember, Mary -- today is Obama's last day! Woodbridge, VA - The Virginia Trump Team continues to unify behind Corey Stewart for Governor. These hard working men and women formed the backbone of the Trump campaign in Virginia, and strongly support Corey's pledge to "drain the swamp", partner with the Trump administration to remove criminal illegal aliens, and bring jobs back to Virginia. Just as Donald Trump places great emphasis on loyalty, so do his supporters throughout the Commonwealth. Says Kristina Johnson, "Corey has backed President-elect Donald Trump from the very beginning and never wavered on that support. I know he will work hand in hand with the Trump administration to carry out Mr. Trump's agenda to make America great again." Annette Truelove adds, "His strength of character and courage of conviction are exactly what we need leading Virginia into the future under President Trump." These leaders know that Virginia cannot afford to elect another Washington insider like Terry McAuliffe. Diane Weber, the Trump Campaign's Albemarle County Chairwoman, strongly endorses our campaign, stating "Corey has a track record of good governance and conservative leadership, and a solid Northern Virginia constituency that the GOP needs to win a statewide election. Corey is the only one who can bring Virginia back into the red-state fold." Eli Valentine, who served the campaign in Norfolk and Chesapeake, is unequivocal: "We defeated the establishment in Washington and now it's time we do it right here in Virginia. We need a governor with strong conservative values and fresh ideas." Shaun Franck supports Corey "without hesitation," adding that "Corey's track record speaks for itself. He has been a leader in fighting illegal immigration in Prince William County, he wants to make Virginia competitive again, and bring jobs back to the Commonwealth. I will work my hardest to see that he is Virginia's next Governor!" Corey Stewart responded when told of the news, "I am so proud to announce the support of these tremendous grassroots leaders and activists. They were instrumental in the Trump campaign here in Virginia and I am honored to have them on my team. With their support, I know that our anti-establishment, conservative message will resonate across the commonwealth as we work hard to take back Virginia from the corrupt insiders." Click HERE or the image above to chip in a generous gift of $25 or more to receive your Corey Stewart for Governor T-Shirt in the mail. Copyright © 2017 Stewart for Governor, All rights reserved. You are receiving this email because you opted in through our website or attended one of our events. LEGISLATIVE ACTION ALERTS on Your Smart Phone!